The Kyocera Group will be exhibiting featured products and technologies at CEATEC JAPAN 2018 — one of Asia's largest tradeshows for cutting-edge IT and electronics — from October 16-19 at the Makuhari Messe International Convention Complex (Chiba pref., Japan). 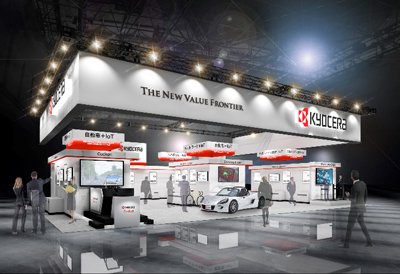 Based on the booth concept of “Realizing a future with IoT for human-beings and for society” the Kyocera Group will showcase various product and solution demos in 5 zones: mobility, energy, advanced technology, lifestyle, and networks. A safe and comfortable mobility society will be realized through advanced driver assistance systems and connected-car solutions. The latest systems utilizing Kyocera's advanced devices infused with Artificial Intelligence (AI), Augmented Reality (AR) and communication technology work together to create connected-car solutions which will be indispensable for IoT in the automotive sector. Visitors can see the Kyocera Concept Car and try out the interactive car driver's seat demo featuring various unique devices and systems. Kyocera's overall strength contributes to realization of the connected mobility society. Devices utilizing Kyocera's new proprietary technologies promote the popularization of IoT. Kyocera introduces key technologies that will be used in various industrial fields from manufacturing sites to healthcare. Advanced technologies play an important role in realizing a comfortable life for everyone. Kyocera introduces various unique products that make people's lives more convenient and comfortable. Sensor devices capable of measuring vital signs help create a pleasant environment for everyone and contribute to preventive medical care, and IoT units compatible with LPWA for use in a variety of applications will be on display. Kyocera Communication Systems Co., Ltd. offers “Sigfox,” an IoT network solution service, in Japan which features low cost, low power consumption and long distance transmission. The company plans to cover 99% of the Japan's population by 2020. The system plays an important role in connecting almost everything through an IoT network, including for uses such as monitoring elderly citizens, preventing bicycle theft, and ensuring the stable quality and quantity of a harvest.